What is NTFC Local 6546? 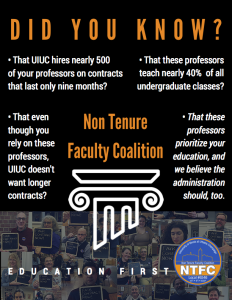 NTFC stands for the Non-Tenure Faculty Coalition, the union on our campus representing lecturers, instructors, teaching, research and clinical assistant professors. We teach everything from small seminars to large lecture courses, conduct research in laboratory and applied settings, and provide clinical instruction in our respective fields. We are an essential part of your education at the University of Illinois. I hear my professors talking about going on strike. What is going on? NTFC has been fighting for a fair first contract for nearly two years. The Administration has chosen to make progress slow. They have told us they have “no interest” in changing the status quo. access to professional development so we can continue to grow as teachers and researchers. So are my professors about to go on strike? We don’t want to strike, but we will. The Administration has pushed us to this point. If they don’t meet with us again soon, we are prepared to withhold our labor in order to achieve a fair contract—we wouldn’t teach, or hold office hours during the time of the strike. It’s a necessary step to show the Administration how essential we are to the University’s mission: education! 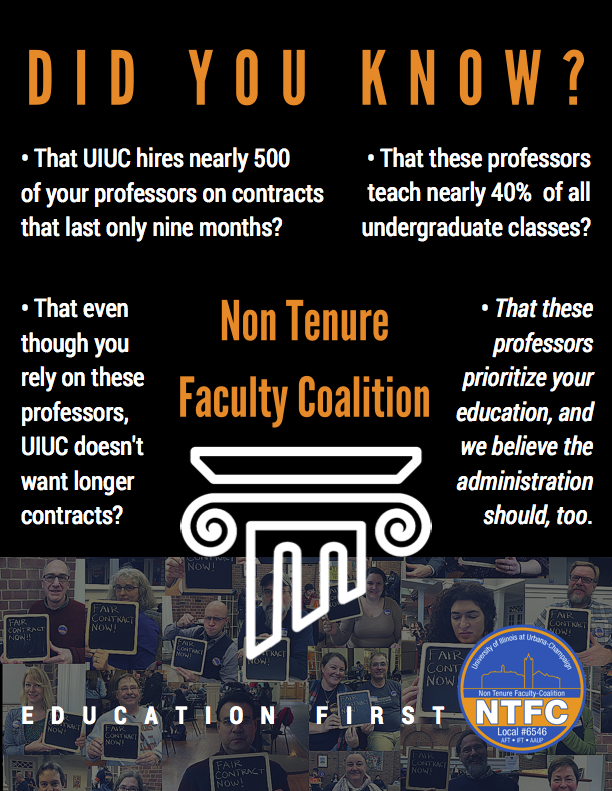 Can’t my professors continue to work and win a contract? We have been polite for nearly two years. The Administration doesn’t see that improving our working conditions improves your learning conditions. We have to show them with a strong action that we are serious about putting education first at this university. What should I tell my parents if there’s a strike? We don’t undertake this lightly. We make this sacrifice for a specific purpose. We are experts in our fields, who devote ourselves to acquiring and disseminating knowledge of our disciplines, as well as performing service to our departments, schools, and the university. The administration relies on our expertise, commitment and passion, while treating us as casual employees. Is this how you want your tuition dollars spent?